Extreme myopia is associated with an acquired progressive large angle esotropia with hypotropia, and limited eye movements termed as “Heavy eye syndrome.” This is a form of acquired strabismus fixus. A combined surgical approach to cataract and strabismus is a safe option in restoring useful vision, binocularity, and appearance in selected patients., It has success rate comparable with that of standard strabismus surgery. Combined cataract and strabismus surgery was first described by Maltzman et al. There are only countable reports of cataract surgery being combined in patients with significant innervational or mechanical strabismus.,,, It is well demonstrated that, in the hands of an experienced strabismus and cataract surgeon, the combined procedure is effective at optimizing eye alignment and improving visual acuity with a minimal number of surgical procedures. The evolution of small-incision cataract surgery and modern strabismus techniques now allows the two procedures to be combined safely and effectively. Here, we report a case of heavy eye syndrome and cataract treated with loop myopexy and phacoemulsification. A 58-year-old female presented to our strabismus clinic with complaints of progressive inward deviation of her right eye and inability to move her eye outward over the past 7 years. There was no prior history of ocular trauma, previous strabismus surgery, thyroid disorder, diurnal variation, diabetes, or hypertension. She had been using high myopic glasses for the past 45 years. Her defective vision worsened in both eyes due to age-related cataract. Two years ago, she underwent cataract surgery with intraocular lens implantation (−6.0 DS) in her left eye. On examination, best-corrected visual acuity in her right eye was HM + and in her left eye was 6/9 (+1.0 DS). Retinoscopic shadow in her right eye was −22 (at 0.75 m). Slit lamp examination of the anterior segment revealed nuclear sclerosis (Grade III) and pseudophakia in the right and left eye, respectively. Fundus examination of both eyes showed myopic degeneration. Axial length was 34.95 and 33.64 mm in the right and left eye, respectively. Her intraocular pressure was within normal limits. On orthoptic evaluation, right eye had >45° of esotropia with hypotropia on Hirschberg corneal light reflex. 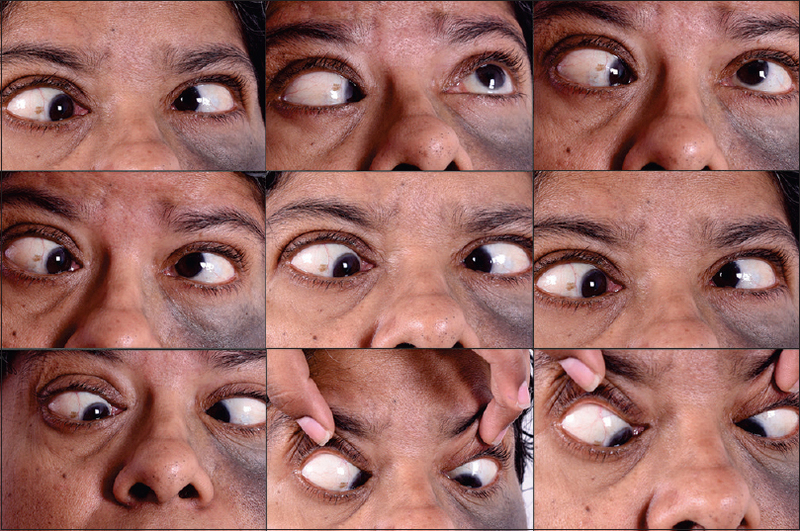 Ocular motility in the right eye was restricted in all direction of gaze except adduction. There was severe limitation of abduction (−6). Left eye ocular motility was normal except mild limitation of abduction (−1). There was >50 prism diopter of the right esotropia with hypotropia on modified Krimsky test [Figure 1]. Under local anesthesia, Forced duction test (FDT) was positive for right medial rectus (MR). After limbal conjunctival peritomy, right eye MR was recessed by 6 mm using hang back technique. 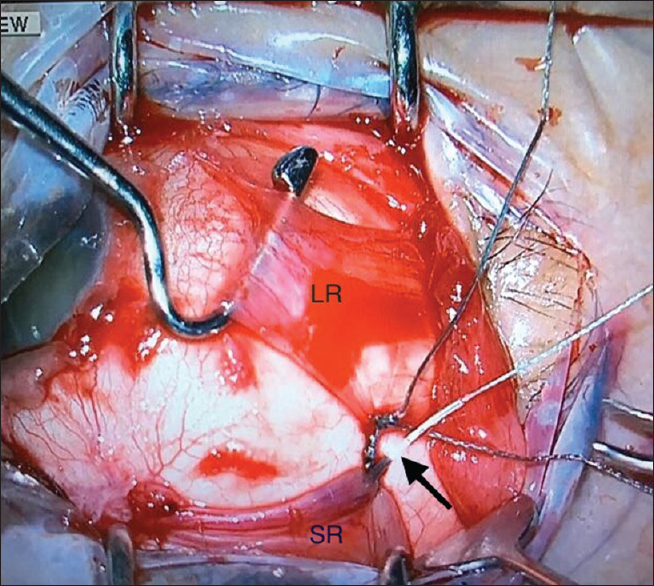 Following this, loop myopexy (muscle union of superior rectus [SR] and lateral rectus [LR] bellies) approximately 14 mm behind their insertions was created along with temporal scleral fixation using nonabsorbable suture (5–0 polyester), thus pulling the eyeball within the muscle cone [Figure 2]. 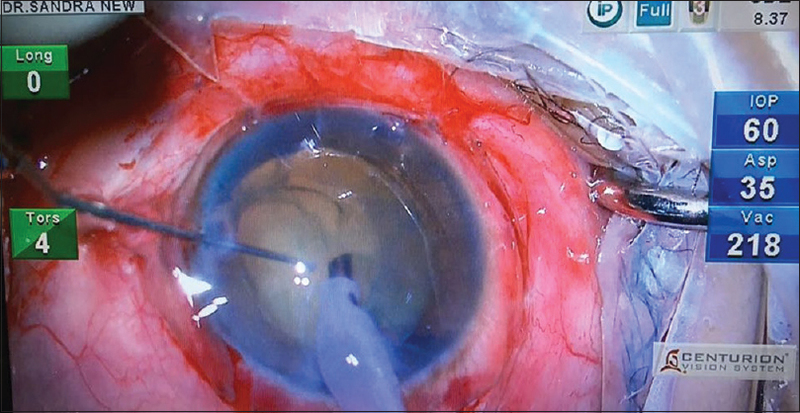 Finally, surgery was combined with phacoemulsification and intraocular lens implantation of − 5.0 DS lens [Figure 3]. Postoperatively, she had a residual esotropia of 15° angle measured with Hirschberg corneal light reflex. Her right eye abduction had markedly improved (−2). She had 30 prisms residual esotropia measured with prism cover test [Figure 4]. Her visual acuity had improved to 6/24 in her right eye. Heavy eye syndrome is caused by axial length elongation, and herniation of sclera between SR and LR. Rowe and Noonan  emphasized axial length elongation and alteration in the direction of LR and SR as the etiological factor for the syndrome. This causes an alteration in the muscle pathway and displacement of muscle pulley. SR is displaced nasally causing mechanical adduction. LR is displaced inferiorly causing abduction limitation. Eye gets fixed in gross esotropic and hypotropic position. Restoration of intermuscular connection is important to prevent further herniation. Conventional recess-resect procedure in heavy eye syndrome is less successful as the basic pathophysiology of the condition is not addressed. The other procedure described to stabilize the eye was superior transposition of LR and MR insertion, loop myopexy of LR and SR, hemitransposition of LR and SR with scleral fixation combined with MR recession (Yamada technique), hemi-Jenson procedure and Yokoyama procedure. In our patient, we performed myopexy of lateral half of SR with superior half of LR, and the suture is secured with a scleral bite to prevent further recurrence. MR recession was done by hang-back technique. Combining strabismus surgery along with other intraocular procedure has been described in the literature. Indications for combined surgery in patients with cataract and strabismus would include: (1) Optimizing visual acuity, motor fusion, and binocular single vision in patients with symptomatic cataract and diplopia, (2) Aligning a mechanically deviated eye with good visual potential to facilitate cataract surgery, and (3) Reducing the number of operations required by high-risk or elderly patients. Combined strabismus surgery with phacoemulsification has been proven to be effective in achieving visual rehabilitation along with cosmesis, reduced hospital stay, and less mental stress for the patients. Combined modified Yokoyama procedure along with phacoemulsification has not been reported in the literature to the best of our knowledge. The procedure can be done successfully in selected patients, which helps in restoring vision along with ocular alignment. Precautions should be taken while performing phacoemulsification; as there is a deep anterior chamber expected due to high myopia and also the residual esotropia may cause an uncomfortable position of the eye. In combined procedures, it is better to change the gloves before proceeding to phacoemulsification and to suture the clear corneal tunnel at the end of the procedure. We also routinely use intracameral moxifloxacin in all cataract surgeries. Among the procedures suggested for myopic strabismus fixus, we recommend modified Yokoyama procedure for ocular alignment. Phacoemulsification can be safely combined with this procedure in selected patients. Taylor R, Whale K, Raines M. The heavy eye phenomenon: Orthoptic and ophthalmic characteristics. Ger J Ophthalmol 1995;4:252-5. Gayton JL, Ledford JK. Combined cataract and strabismus surgery. Ann Ophthalmol 1993;25:295-7. Squirrell D, Edwards M, Burke J. Combined strabismus and phacoemulsification cataract surgery: A useful option in selected patients. Eye (Lond) 2001;15:736-8. Zwaan J, al-Sadhan Y. Combined intraocular and strabismus surgery. Ophthalmic Surg Lasers 1998;29:456-61. Maltzman BA, Caputo AR, Cinotti DJ. Combined intraocular lens and strabismus surgery. J Cataract Refract Surg 1986;12:65-9. Rowe FJ, Noonan CP. Surgical treatment for progressive esotropia in the setting of high-axial myopia. J AAPOS 2006;10:596-7. Herzau V, Ioannakis K. Pathogenesis of eso- and hypotropia in high myopia. Klin Monbl Augenheilkd 1996;208:33-6. Durnian JM, Maddula S, Marsh IB. Treatment of “heavy eye syndrome” using simple loop myopexy. J AAPOS 2010;14:39-41. Yamada M, Taniguchi S, Muroi T, Satofuka S, Nishina S. Rectus eye muscle paths after surgical correction of convergent strabismus fixus. Am J Ophthalmol 2002;134:630-2. Yokoyama T, Ataka S, Tabuchi H, Shiraki K, Miki T. Treatment of progressive esotropia caused by high myopia – A new surgical procedure based on its pathogenesis. In: de Faber JT, editor. Transactions: 27th Meeting, European Strabismological Association. Florence, Italy: Lisse:Swets & Zeitlinger Publishers; 2002. p.145-8.